Hurricanes Harvey, Irma, and Maria tested the mettle of first responders in the hardest hit areas. With help from community members as well as compassionate citizens and outside law enforcement agencies, police departments gathered their resources and adapted as needed to maintain public safety. Hurricane Harvey hit southeast Texas along the Gulf of Mexico. Houston experienced record rainfall that caused flooding beyond anything anyone can recall happening in the city before. 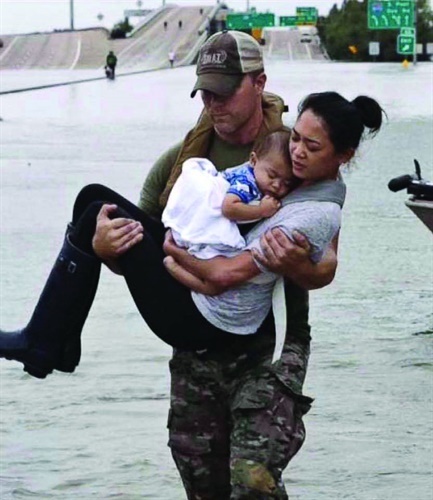 Even with evacuation orders in place, the Houston Police Department ended up conducting around 5,000 rescues. "It was surreal," says Houston Police Chief Art Acevedo. "Everywhere I looked, houses, businesses, cars, were completely under water. And the fourth-largest, fastest growing big city in America turned into a series of islands in a matter of hours." Hurricane Irma soon followed in Florida, hitting the lower keys the hardest. Puerto Rico suffered through two successive hurricanes: Hurricane Irma and then Hurricane Maria, a category 4 hurricane that caused devastation, knocking out power and all communications over most of the island. But no matter what, law enforcement officers were on hand to protect and serve as best they could. "I saw an incredible show of devotion to duty," says Lt. Steven Castell, commanding officer for the City of Miami Police Department's Office of Emergency Management and Homeland Security. "Everybody came in to work. Despite damage to their homes, they felt that dedication, that calling of the badge to come in and help their community." 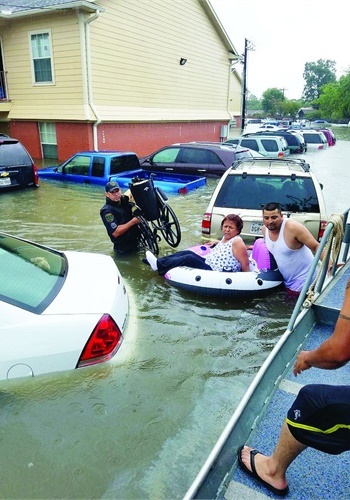 When a major event such as a hurricane occurs and residents are told to evacuate, non-essential law enforcement personnel evacuate as well for their own safety. With so many people gone, the officers who stayed behind often had to take on different roles to take care of mundane tasks that were suddenly essential. 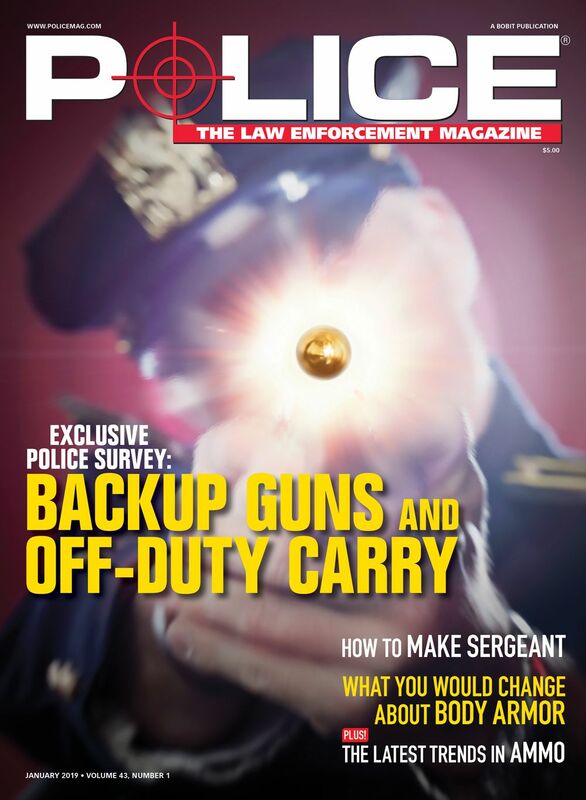 "You need to think outside the box," says Chief Donie Lee of the Key West (FL) Police Department. "We had an officer who was a professional chef before he became a police officer and we utilized that talent. He cooked and cleaned throughout the event. All of the members really appreciated that." In Houston, cadets took over janitorial duties at the police station so trash wouldn't pile up and create a health issue. Miami Police Department officers of all ranks showed up to do whatever they could, regardless of their usual roles. "We had people here that were a few days or a week into their law enforcement careers, academy recruits who had just been hired, all the way up to personnel slated to retire literally working right up to the last hour as an employee," says Castell. 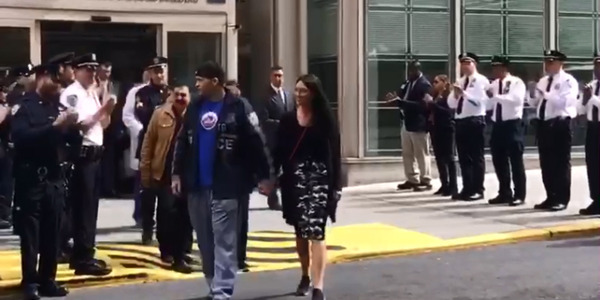 "That was one of the most incredible things I've seen in 20 years of law enforcement." And of course officers took on the role of rescuer when needed. They waded through floodwaters and used boats and any other vehicles that would get them where they needed to go to move people to safety. "It was all hands on deck in that water," says Chief Acevedo. He joined the rescue effort the Saturday that rain really started to fall in Houston as Harvey hit and found himself wading through water up to his waist in the dark with other members of the Houston PD. He participated in rescuing several hundred people from a flooded apartment complex that night and was proud of his officers. But he also remembers it as one of the most disgusting experiences of his career. Sgt. Kim Barnes saw a water moccasin swimming toward the chief. She grabbed the poisonous snake and tossed it through the air well away from him. 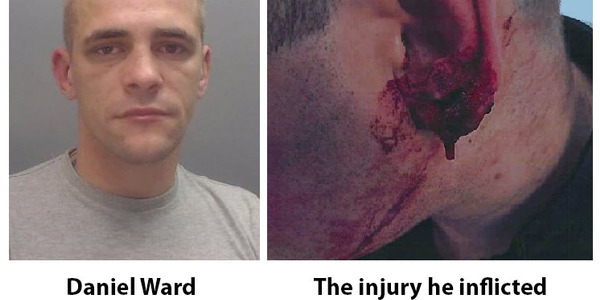 But that wasn't the worst of it. 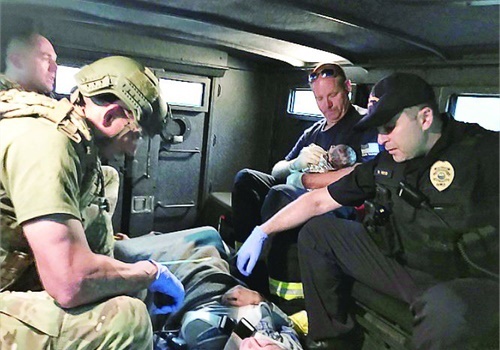 When he got back in the high-water rescue vehicle, Acevedo took off his soaked uniform shirt and live cockroaches started crawling off of his body. At least they all got a good laugh out of it. Planning for response to major disasters is essential, but it must be partnered with training so that everyone is on the same page should an event occur. The more training you can do, the better. "One of the greater challenges we faced was the fact that we have not been impacted by a hurricane in about 12 years," says Miami PD's Castell, who advises the chief regarding disaster preparedness and response. "The last one was Hurricane Wilma in Oct. 2005. In between, there was a lot of institutional knowledge that we lost when officers retired." But because the state of Florida and the Miami Police Department in particular have continued to train extensively each year according to established disaster preparedness plans, the planning and response during Hurricane Irma went as smoothly as could be expected, he says. And Miami was lucky this time that it came away relatively unscathed. "In the aftermath of Irma and then Maria, the amount of devastation that was left behind in Puerto Rico…that very easily could have been us," says Castell. There are some plans that you have to make at the outset of a particular natural disaster you see coming, making the best decisions you can with the training and information you have available. Acevedo believes that one of the best things you can do to prepare officers leading up to a hurricane or similar event is to be clear with them what they can expect to experience. "If you can set the expectation on the front end, it saves you from a lot of heartache on the backend," he says. But it might be even more important to make strategic moves before the event takes place. "We didn't wait until the storm hit to up our operational footprint," Acevedo explains. "We went into tac alert on Friday, even before the storm hit Saturday night, to afford us time to identify any logistical problems." But he still wishes he had done some things differently. During Hurricane Harvey, Houston PD Officer Steve Perez died in the flood waters attempting to drive to the station so he could work his shift and help with water rescues. 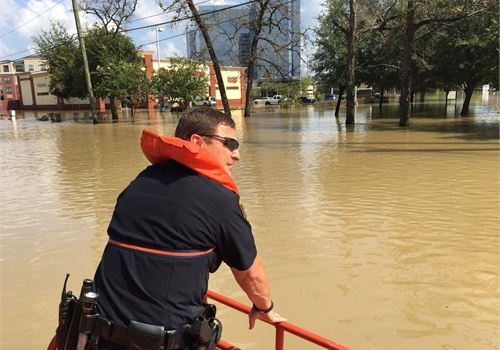 Chief Acevedo can't help but wonder if it would have turned out differently had he implemented 24-hour shifts Saturday morning so officers wouldn't have had to commute in to work during the heavy rains the next morning. To maintain both officer and citizen safety as much as possible, Houston officers were working in a minimum of two-person teams in "cage cars" so they would have enough people on hand to help anyone they encountered as well as handle any other situations that might occur. "We not only rescued thousands of people, but maintained order, before, during, and after," says Acevedo. "We never lost order in this city." Communication is critical for any law enforcement operation, and even more so during a natural disaster. So finding ways to keep the lines of communication open for agencies dealing with the recent hurricanes was paramount. "We lost our phones, our computer systems, our cell and radio towers," says Chief Lee of the Key West PD. But the agency didn't let that stop them from communicating with each other and with citizens during and after Hurricane Irma. They were able to set up two traditional analog landlines, which they used to contact non-essential personnel that had evacuated during the worst of the hurricane and later needed to return to work. Because they had some difficulty using their satellite phones, Lee says he would also like to have VHF radios on hand for future natural disasters. For communication with the public, the Key West Police Department improvised. They took advantage of the fact that one local radio station was successfully using a generator to continue operations and broadcast locally. "We would drive to the station with updates for residents who had not evacuated," says Lee. "Key West is an island of just two miles by four miles, so word of mouth can also be fairly effective when communications are completely out." The Houston Police Department lost its 911 communications almost immediately when Hurricane Harvey hit the area, says Chief Acevedo. But cell phone towers were operational, so the agency was able to use social media to communicate with the public. Officers were even able to determine where to respond based on citizens' messages requesting help via Twitter and Facebook. 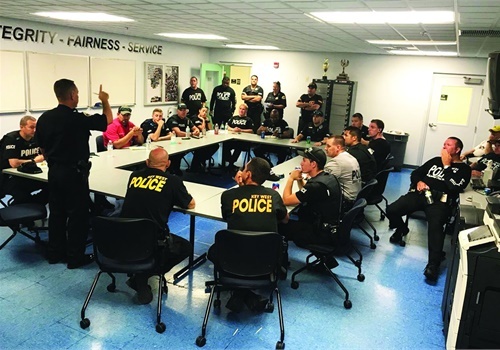 Law enforcement agencies from all over the United States reached out to offer their help to fellow officers during and after the hurricanes. Hurricane Maria hit Puerto Rico on Sept. 20, killing at least 16 people and leaving nearly all 3.4 million people without power and most without water. The Department of Public Safety in Puerto Rico issued a statement thanking 17 Massachusetts officers, 54 New York officers, 98 New Jersey officers, 36 NY and NJ Port Authority officers, and 279 federal officers for their help. A contingent of 10 Metro DC Police officers spent a week there directing traffic and delivering food and water, among other duties. Eight of the officers were former Puerto Rico Police officers. It was an emotional experience, but they were glad to have been able to lend their assistance. 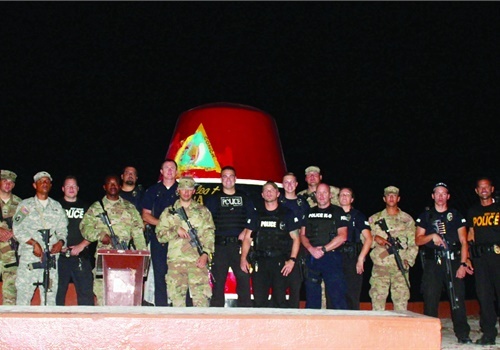 Even though their own homes were damaged by Hurricane Irma, a group of Miami police officers volunteered to bring aid and support to first responders in heavily damaged areas of the lower Keys, including the city of Key West. The disaster assessment team of six City of Miami police officers brought in thousands of bottles of water, food, and nonperishable supplies to help their fellow officers. They also cooked meals. "At the end of the day if we have to eat MREs, we will. But when help arrives and provides support by a hot meal, it really helps improve morale," says Lee. Houston's Chief Acevedo shares the same sentiment. "We had brothers and sisters that came and cooked thousands of meals…Mobile County Sheriff, Baton Rouge…it just meant the world." Yet more people and supplies arriving during an already stressful time can pose problems as well. "It's all well intended but there are logistical challenges that come with the onslaught of help that comes in," says Lee. For example, he recommends establishing a point of contact to coordinate all donations, keep an inventory, and make sure the right items get to those in need. 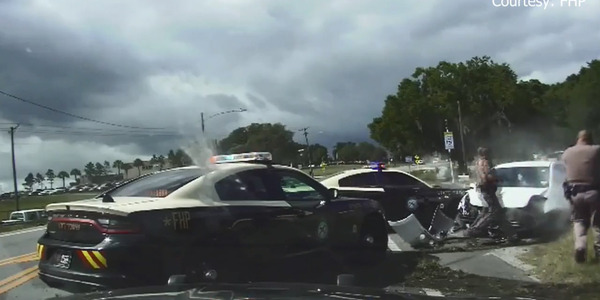 Realistically, during natural disasters like Hurricane Irma, officers aren't able to patrol as heavily as usual, if at all, out of concern for officer safety. This is a prime opportunity for criminals to start looting. But since Miami wasn't directly impacted, when storm winds started to subside and the Miami Police Department started to get reports of looting, commanders decided to break with tradition and policy and allow some officers that were "sheltering" to go out and search for looters. "There was a command decision made to let a team go out and they took heavier SWAT vehicles," Castell says. "It was incredible. It was a huge morale boost, knowing they could help the community by stopping looting in progress." People watching from their homes even started applauding the officers. 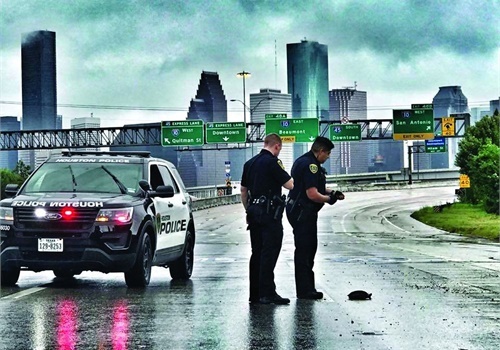 For its part, the Houston Police Department deployed resources ahead of time to businesses traditionally targeted by gang members and others when the electricity goes out during natural disasters. Police officers in plainclothes and in black-and-whites were sent to pawnshops, gun stores, and pharmacies. "Our last hurricane, Hurricane Ike, lots of guns were stolen. This time we were able to nip it in the bud," says Acevedo. These efforts were appreciated by the officers' communities, as was the overall response to the hurricanes and their aftermath. "If there's one takeaway, it's this: You can plan all day every day, but you better be prepared to adapt," says Key West PD's Chief Lee. "In a disaster you must be able to adapt and overcome and respond. Our members met the challenge." Most people picture boats when they think of citizens being rescued from flood waters after a hurricane hits. But all manner of vehicles can be repurposed to aid in rescue and recovery after a disaster. Because of concerns over the "militarization" of law enforcement, many agencies have been criticized for using armored vehicles, some of which were obtained as military surplus. But many of them came in handy when responding to the recent hurricanes in Texas and Florida. "All that equipment came into play," says Chief Art Acevedo of the Houston (TX) Police Department. "So I'm glad that our military surplus high-water rescue vehicles, our MRAPs, our Hummers [Humvees] all were leveraged by this police department. We just saved thousands of lives here in Houston." 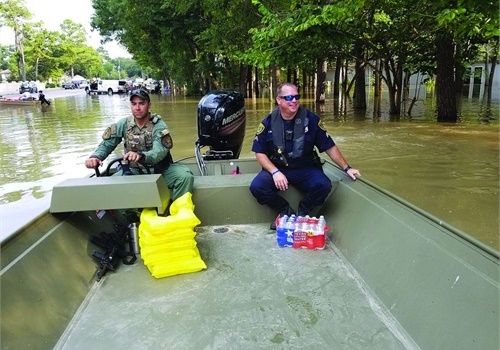 Officers used the vehicles to navigate flooded highways and reach neighborhoods for rescues that other vehicles could not. Even in areas that weren't under water, normal cars and trucks had difficulty getting through areas where fallen trees and debris from damaged homes and other buildings created obstacles. SWAT vehicles allowed officers and other emergency responders to get to stranded families in need of help. For example, when a Coral Springs, FL, woman went into labor during Hurricane Irma, her family called 911. Police and fire crews drove an armored vehicle through the city to reach them. The Coral Springs police officers and firefighters then used the vehicle to take the mother and baby to the hospital to be evaluated. Construction vehicles can also be useful to help clear roads of dirt and debris and to remove items off of and around damaged homes. "If you have the luxury of front-end loaders, if you have members that know how to operate these vehicles, plan for their use," suggests Chief Donie Lee of the Key West Police Department. "If possible, stage them at the station in case it's needed."